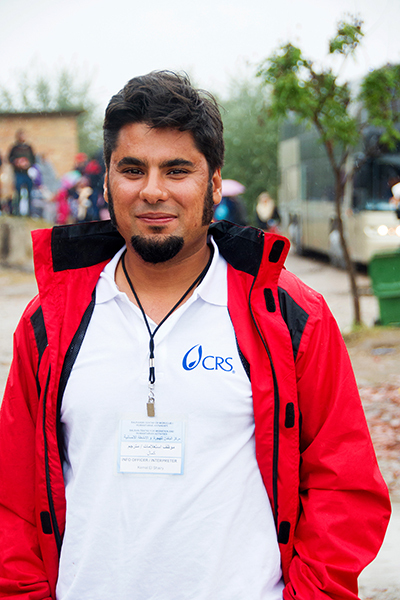 As the chief translator for Catholic Relief Services in Serbia, Kemal El Shairy, 28, is on the frontlines of our humanitarian response to the European refugee crisis. A Ph.D. student in international relations at the University of Belgrade, El Shairy’s days are now spent trying to help people at the heavily trafficked border crossings better understand their legal circumstances and potential next steps. “We are on call nonstop. People coming through need information. Many times they don’t know where they are, or they’re not sure if they’re going to be arrested, or registered, or whether they’ll be allowed to leave. So our main job is to explain things to them,” El Shairy says. In Europe, the refugee crisis continues to grow, with increasing numbers of people fleeing their countries of origin, primarily Syria, Afghanistan and Iraq. Working with our Church partners, CRS is responding in Greece, Italy, Macedonia, Serbia and Bulgaria. So far, CRS support has reached 350,000 people in the Balkans in 2016, and we continue to provide assistance to 25,000 refugees and migrants every month. 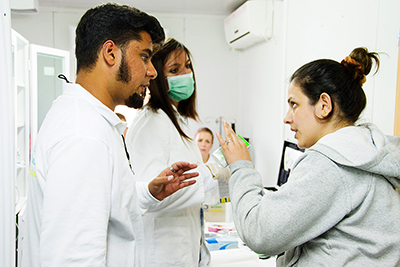 In Serbia, we’re providing medical support, translation services, legal support, temporary shelter, food, water and hygiene items. El Shairy recently spoke with us about what it’s like to help people fleeing conflict for a better life. Q: When refugees cross into Serbia, what condition are they in? A: They're usually in a very difficult situation, especially with the recent rain. A lot of them are barefoot with inadequate clothes. They need blankets, raincoats and basic clothing. Q: What kind of need is there for translators? A: When people come off the bus, they are entering the unknown from one area to another. The unknown factor is omnipotent; it's ubiquitous … The information that we provide them, at least the information that we’re allowed to convey, is absolutely crucial. We’re explaining to them even the most basic things like the name of the city they’re in. For example, most refugees don’t even know how to pronounce the next city they’re going to. Q: Can you describe the migrants you’ve met? A: All of the people I’ve met are from war-torn, war-stricken countries who are trying their best while facing many hardships in order to get, for themselves and for their children, a better life in Europe. Serbia is just their resting point. Q: How do you cope with the stress of your job? A: It might sound a bit cold and insensitive, but in order to help people, you have to distance yourself a bit. Because those people, especially those traveling with families, they don't need hugs. They don’t need someone to console them. They need help. They need accurate information that can help them better understand their circumstances. And if you get too close to people, they will not perceive you as a person that can help them. Q: Do you relate to those people you’re helping? A: Personally, of course. What motivates me is that my father is Libyan, which is a war-stricken country just like Syria, Iraq and other Arab countries. Personally I haven’t lived through war, but I know how those people feel … I know how it affects people … Let’s just say that I feel a certain moral obligation to do my best to help these people bridge the language gap. Q: What do you hope for? A: I hope people continue to care about these refugees … I only ask that people try to put themselves in others’ shoes. What would you do if this happened to you? How would you react? Would you help someone who could be your mother, your father, your sister or your brother? Or would you just walk by? Q: Can you describe how the support of CRS in Serbia is helping people? A: If it weren’t for the CRS doctors, a lot of people would have blisters. They wouldn’t be able to walk. Thus, they wouldn’t be able to reach their destination … So CRS and Caritas are definitely helping those people along their journey. CRS is helping these refugees be well, be safe and be healthy so that they can move on towards a bright future.